With a combination of 68 years experience in various career endeavors, husband and wife, Sam and Tammy Hatfield, joined their efforts in a career sustaining opportunity. Sam Hatfield Realty opened in May of 2005. Sam brings to the table 32 years sales experience. Having worked 21 years with Life of Georgia Insurance Company, Sam began selling boats with Tri-Lakes Marine, which later became Travis Boating Center. In 2001 Sam acquired his real estate license, which proved to be a valuable asset with his connections at Travis Boating Center. The venture continued to be a success and thus, Sam acquired his broker’s license. Tammy brings to the table 13 years experience in business/industry, before entering the education arena. In 1995, Tammy began teaching business and marketing at Tullahoma High School. From the classroom, Tammy served 5.5 years as Dean of Women at Tullahoma High School. In January of 2009, she accepted the position as Director of Special Education with Tullahoma City Schools. 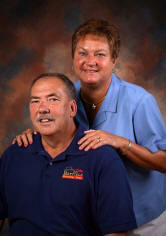 Tammy acquired her real estate license in 2005 and assists in the business. Sam saw a “hole in the market” when he introduced the Lake Property Management arm of the business. This service allows property owners to enjoy their investment to the fullest. Property owners can relax knowing that their home is being looked after in their absence. For more information, please visit our link on this website. Last, but definitely not least, was the establishment of Sam Hatfield Lake Vacation Rentals. We currently have 17 lake homes available for vacation rentals – nightly, weekly, or monthly. All are completely furnished and most have floating boat dock. Visit our link on this website for rates and availability. The real estate market, coupled with lake vacation rentals and lake property management, has created a strong network of lake property enthusiasts for our company. Whatever your needs may be on Tims Ford Lake, we trust we can be of service.